Would YOU pay to run your MJ ATA again? Posted: Thu Nov 18, 2010 3:37 pm Post subject: Would YOU pay to run your MJ ATA again? I would not be opposed to paying 29.99 a year vs the 19.99 for a open device solution from MJ, with the understanding they dont support your device. My issues though stem from not just the fact I can't run my account in asterisk any more but the fact they impose other restrictions on where you can call. I have a few friends in the blocked areas. $29.99/year and that is why I switched to NetTALK. laser that is why I started offering my own voip Though if that was a option I would of prob did that and save my self the head ache. 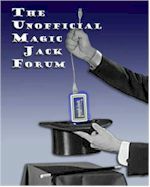 Posted: Sat Aug 27, 2011 10:28 am Post subject: Re: Would YOU pay to run your MJ ATA again? Would YOU pay to run your ATA again? Not as long as Google Voice on the Obi is free and unrestricted. It is better than MJ ever was for a one time fee under 50 bucks. Posted: Tue Aug 30, 2011 5:43 pm Post subject: Re: Would YOU pay to run your MJ ATA again? Depends on who is providing the info necessary to make mJ work with an ATA again. -If it is a 3rd party that has found a way around the new mJ authentication method, then I would probably not be willing to pay anything, as I feel mJ would probably change their method again thus disabling what I paid the 3rd party for. -If mJ would charge a minimal fee (maybe around $10) I might consider going that route rather than let my mJ expire. Zyztems - Exploit Technology, Not People!